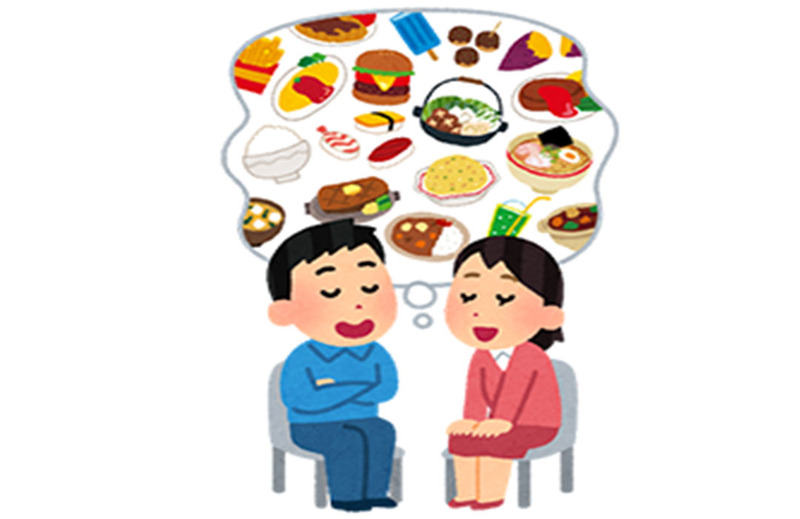 ご当地グルメ is a Japanese expression meaning regional specialities, and in most cases refer to fast food. They are affordable and have been associated with 町おこし (machi okosi; town revitalization) over various eras within Japan. Some types of ご当地グルメ are derived from 郷土料理 (kyōdo ryōri; regional cuisines). Trying out ご当地グルメ is one of the favourite highlights of many Japanese tourists who go on 国内旅行 (kokunai ryokō; domestic trip). You can often find them at パーキングエリア (pākingu eria; highway parking area) and 道の駅 (michi no eki; roadside stations). Local タクシーの運転手 (takushī no untenshu; taxi drivers) may know of delicious but lesser known restaurants. If you plan to visit local Japanese towns next time, try asking 地元の人 (jimoto no hito; local people) in order to experience ご当地グルメ. 推しメン (oshimen) is the shortened form of an いち推しメンバー (ichioshi menbā; my recommended/ favourite member), a word often used by fans who 応援する （ōensuru; supports) their 推しメン in アイドルグループ (aidoru gurūpu; idol groups). In Japanese ポップカルチャー (poppu karuchā; pop culture), many アイドルグループ are made up of a surprisingly large number of members. For example, the famous girls idol group モーニング娘。(mōningu musume) currently consists of 14 members while AKB48’s over 48 members are divided into “teams” within the group. With so many singers to select from, it’s not easy to find an 推しメン. Incidentally, Japanese アイドル usually refers to “young stars” who generally play very diverse roles in Japanese ポップカルチャー. Many アイドル, both female and male, not only sing and dance but may also host variety programs, take on modelling gigs, and star in films or television series. 邦画 (hōga) generally refers to Japanese films and is often used relative to洋画 (yōga; foreign film). During its long history of over hundred years, the 映画産業 (eiga sangyō; film industry) in Japan has been produced films in various ジャンル (janru; genre), such as ドラマ (dorama; drama), ホラー (horā; horror), コメディー (comedī; comedy), 恋愛 (ren-ai; romance), アクション (akushon; action) and 時代劇 (jidaigeki; period drama), and so on. Two prominent ジャンル that have originated from Japan are アニメ (anime) and 特撮 (tokusatsu; “special films” that use special visual effects), such as Godzilla. These categories have also become popular among fans around the world. 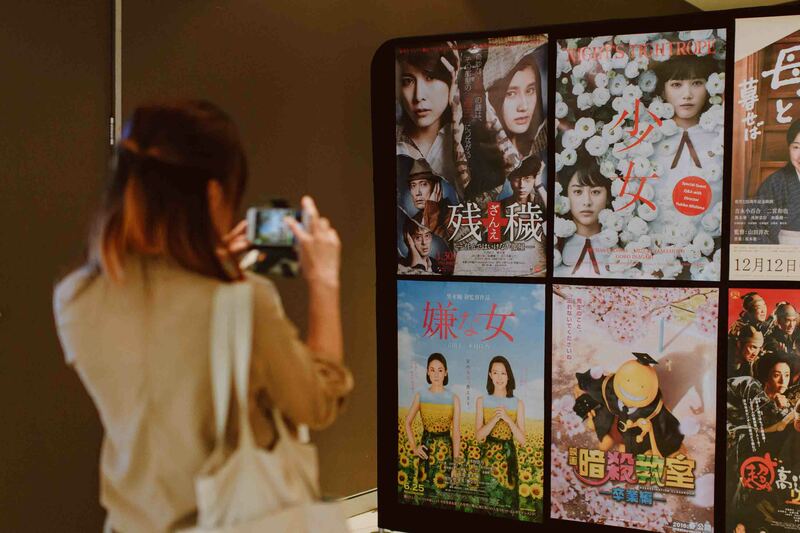 In recent years, Japan’s love of アニメ has sprouted 実写版 (jisshaban; live-action) adaptations of various popular series, ranging from uplifting 青春ドラマ (seishun dorama; teen drama) to outrageous fantasy films. Who knows what 邦画 will bring next? インスタ (Insuta) is an abbreviation of the SNSアップ (appu, app) known as Instagram. 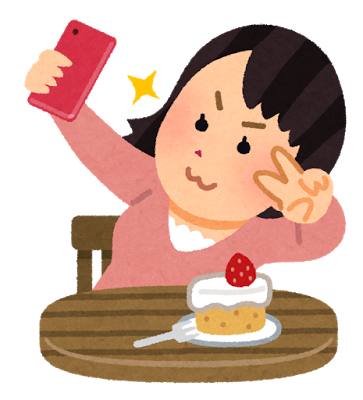 The app is used to sharing 写真 (shashin; photos) and 動画 (dōga; videos) online with other 利用者 (riyōsha; user). It is becoming increasingly popular in Japan, especially among younger women. Instagram users can subscribe to another users’ account and become a フォロアー (foroā; follower) to receive notifications when new photos are posted. The photos that インスタグラマー (insutaguramā; Instagrammer) find worthy to post are called インスタ映えする写真 (insutabaesuru shashin; Instagrammable photos). Other users may recognize Instagram-worthy photos by giving them ‘Likes’ in the shape of a heart. 観光地 (kankōchi; tourist spots) are great sites to take インスタ映えする写真. However, new trendy places, such as hotel rooms with nice views, おしゃれ (oshare; stylish) and かわいい (kawaī; cute) restaurants and famous cafés with colorful スイーツ (suītsu; sweets) are also riding on this SNS boom. 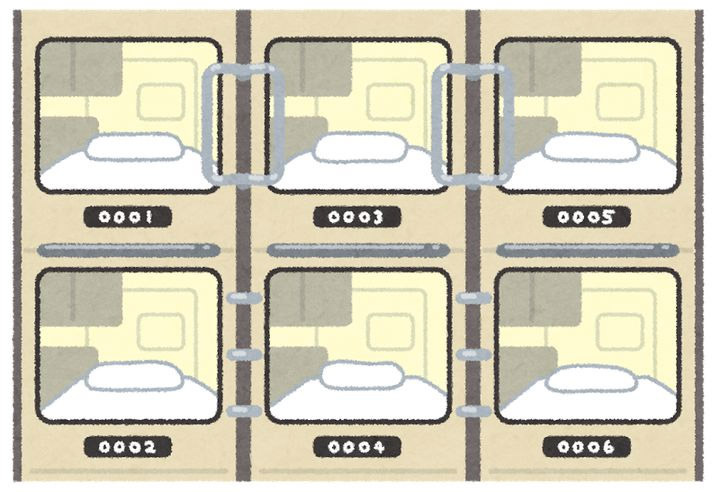 カプセルホテル (kapuseru hoteru; capsule hotel) is a type of accommodation originating from Japan. Each 部屋 (heya; room) consists of many small pods. Often located near a station, these places are stereotyped as cheap overnight accommodation for drunk サラリーマン (sararī man; office worker) who missed the last train and couldn’t return home. Recently, its 進化 (shinka; development) is a hot topic in Tokyo. Some カプセルホテル are furbished with attractive ファシリティ (fashiritī; facility), such as アメニティ (amenitī; amenity), コインランドリー (koin randorī; coin laundry), キッチン (kicchin; kitchen) and 女性専用フロア (josei senyō furoa; floor for women only). The small sleeping quarters are not only 便利 (benri; convenient) but are also快適 (kaiteki; comfortable). Now you can test it for yourself at Australia’s first カプセルホテル which opened in Sydney in May 2017. 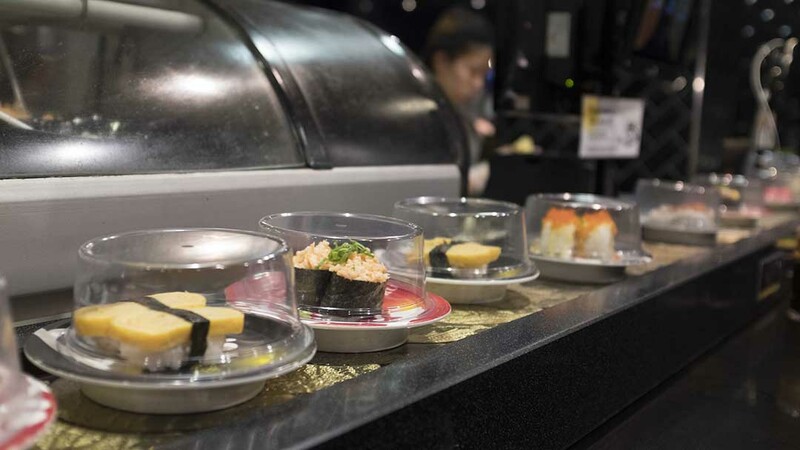 回転寿司 (kaiten-zushi; rotation sushi), commonly known as sushi train in Australia, is also called くるくる寿司 (kuru kuru sushi), an onomatopoeia for “going round and round”. The very first 回転寿司 was opened in 1958 Osaka by Yoshiaki Shiraishi, who found inspiration from a conveyor belt in a ビール工場 (bīru kōjō; brewery). The affordable sushi train gained significant popularity and has become a huge industry in Japan. 回転寿司店 (kaiten zushi ten; rotation sushi shop) are partly セルフサービス (serufu-sābisu; self-service), where customers simply pick up a plate of their favourite sushi from the moving conveyor belt. However, if your desired すしネタ (sushi neta; sushi topping) doesn’t come, you can order it a la carte. さびぬき (sabi nuki; without wasabi) can also be requested. Your eyes may sparkle at the variety of sushi but remember that it is poor manners to directly touch sushi that’s still on the train, let alone return sushi you’ve already picked up. PHP INTERFACE. 2008. Kaiten-zushi maruwakari jiten [回転ずし まるわかり事典]. Tokyo: PHP Institute. Japan is known for its modern cityscapes and traditional sightseeing areas, but did you know that this small country has 34 国立公園 (kokuritsukōen; National Park) and 4 世界自然遺産 (sekaisizen’isan; World Heritage sites)? Japan’s 国立公園 are designated to include privately-owned properties, allowing you to observe the 暮らし (kurashi; livelihood) of residents and the 産業 (sangyō; industries), such as agriculture and forestry. The ビジターセンター (bijitāsentā; visitor centre) of a 国立公園is a good starting point to discover the surrounding area’s 自然 (shizen; nature) and 歴史 (rekishi; history). Their free パンフレット (panfuretto; pamphlet) contains plenty of information. You can also ask a volunteer ガイド (gaido; guide) to introduce the types of activities you can experience in nature. These include 登山 (tozan; mountain climbing), ハイキング (haiking; hiking), スキー (sukī; skiing), キャンプ (kyanpu; camping), カヌー (kanū, canoeing), シュノーケリング(shunōkeringu; snorkelling) and バードウォッチング (bādowocching; bird watching). 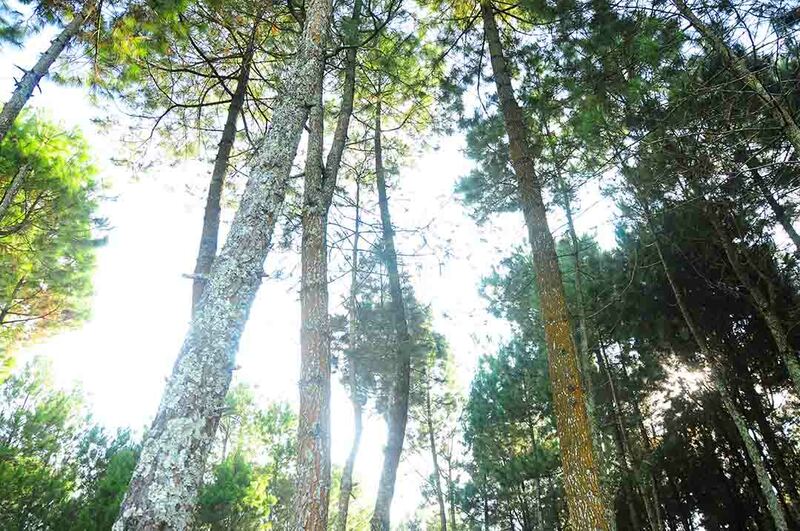 More information is available on the Ministry of the Environment’s website. There are some老舗呉服店 (shinise gofuku ten; long-established shops) in Kyoto that promote their レンタル着物 (rentaru kimono; rental kimono ) service. The number of tourists who enjoy this handy service is growing year by year. You can choose your favourite kimono from a wide range of rich 色 (iro; colours) and デザイン (dezain; designs). There is no need to worry about 着付け (kitsuke; putting on the kimono), because it’s banded in convenientセットプラン (Setto puran; set plans) which also includes帯 (obi; sash), 足袋 (tabi; toe socks), 草履 (zōri, Japanese style sandals) and バック(baggu, bag) . The outfit is available for both 女性 ( josei; women) and 男性 (dansei; men). 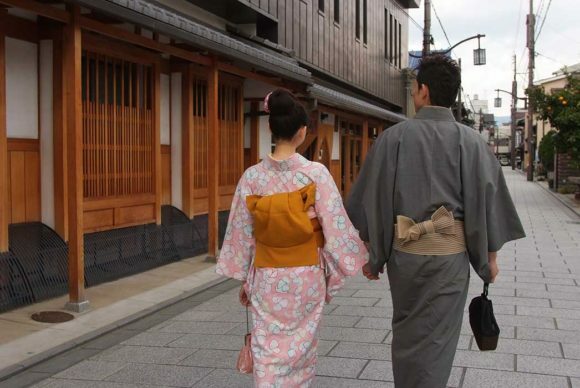 On your next trip, the レンタル着物 will make your dream come true — to stroll around an old town wearing a traditional Japanese outfit. Wabi-sabi is a Japanese philosophical concept seen in traditional Japanese arts, such as 茶道 (sadō; tea ceremony), 俳句 (haiku; a Japanese poem in 5-7-5 syllabic form) and 陶芸 (tōgei; pottery). Its meaning cannot be easily defined with language. Something that is wabi-sabi evokes an inner appreciation of its quiet simplicity and its changing form over time. 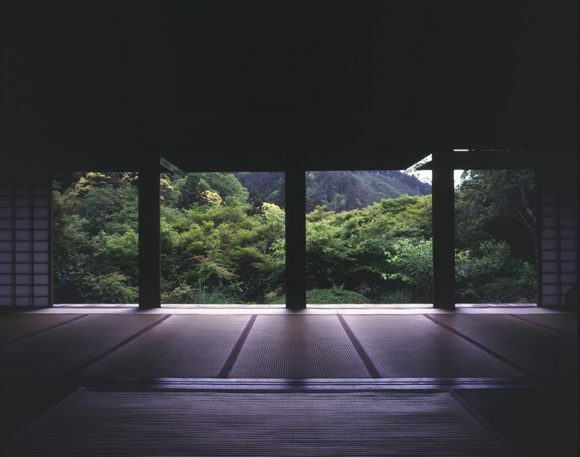 For example, think back to your visit to an old and lonely temple or quiet Japanese Zen garden. Were you touched by the beauty of its simplicity? Like the concept it represents, the meaning of the word wabi-sabi is interpreted differently in the West. Since the beginning of 2017, wabi-sabi has been trending in media in the US, becoming the latest lifestyle concept after 2016’s Danish word hygge. In France, you can visit the WABI-SABI pavilion at the ジャパン・エキスポ (Japan Expo) in July 2017, which will introduce 伝統文化 (dentō bunka; traditional arts) of Japan. 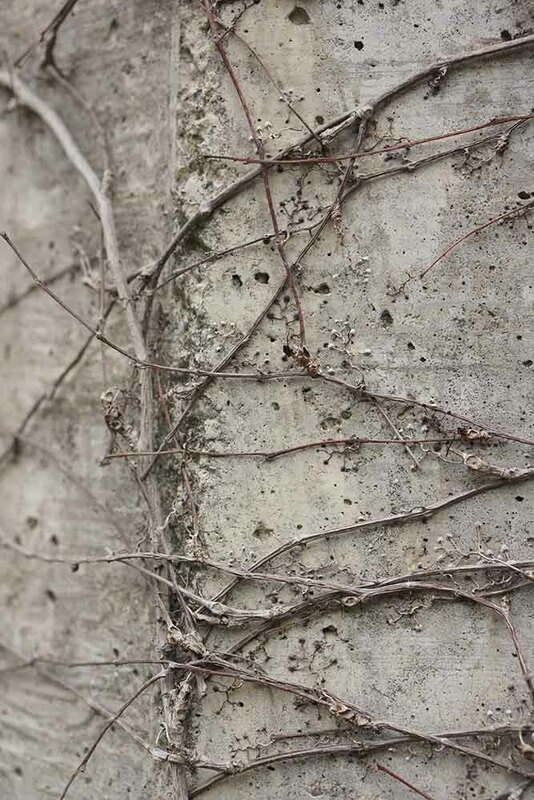 Wabi-sabi may become a universal word in the near future, used in not only Japanese culture but also the areas ofファッション (fasshion; fashion) and インテリア (interia; interior design). プレミアムフライデー (puremiamu furaidē; Premium Friday) is a government-backed campaign aimed at boosting Japan’s consumer spending. Launched on 24 February 2017, the initiative encourages companies to let their employees leave work at 3 pm on the last Friday of each month and invites 消費者 (shōhisya; comsumers) to spend more on their “long” weekend. 小売業 (kourigyō; retailers) and サービス業 (sābisugyō; service-sector) companies are joining the movement. For example,レストラン (resutoran; restaurants), デパート (depāto; departments stores), ホテル (hoteru; hotels), and 旅行会社 (ryokōgaisha; travel agents) have started offering special rates and discounts on Premium Friday. The 政府 (seifu; government) is also spearheading the campaign as a part of the 働き方改革 (hatarakikata kaikaku; ”work style reform”) to reduce Japan’s long working hours. However, it will take time for プレミアムフライデー campaign to take root. Travellers to Japan should keep an eye out for good deals on the last Friday of each month. The word 聖地巡礼 (seichi junrei) means pilgrimage. In particular, it is 巡礼 (junrei; pilgrimage) to some kind of 聖地 (seichi; holy ground). However, this word has also come to refer to a kind of holy ground that you may not expect. 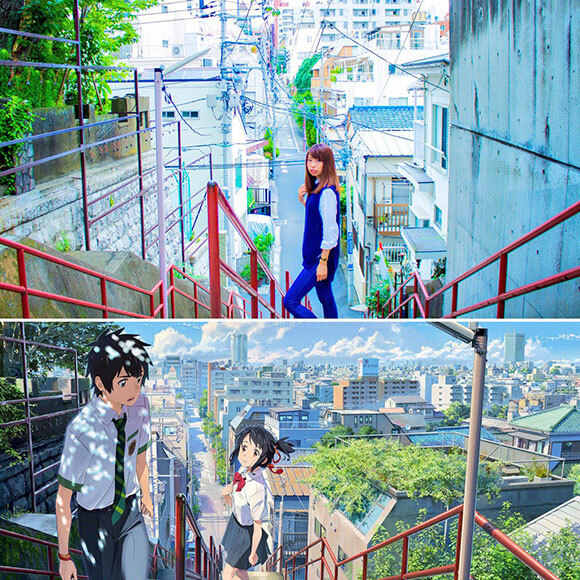 The settings of many of Japan’s anime series and films are based on real world locations, which fans sometimes seek out and visit. This alternative 聖地巡礼 involves travelling to the ロケ地 (rokechi; location of filming) to experience a piece of one’s favourite show. Many visitors try to recreate shots from the show in their own photos. One very recent addition is the hit movie 君の名は (kimi no na wa; Your Name), released in 2016. The film brought a large number of visitors to the regional town of 飛騨市 (hida shi; Hida), in Gifu prefecture, in addition to other locations like the stairs in the photo, a spot in Tokyo not far from 四ッ谷駅 (yotsuya eki; Yotsuya station). An older example is the animeらき☆すた (raki suta; Lucky Star). One of the main ロケ地 for this show is 鷲宮神社(washinomiya jinja; Washinomiya Shrine) in Saitama prefecture. Due to the popularity of the show, this place has now become a hub for all things Lucky Star. 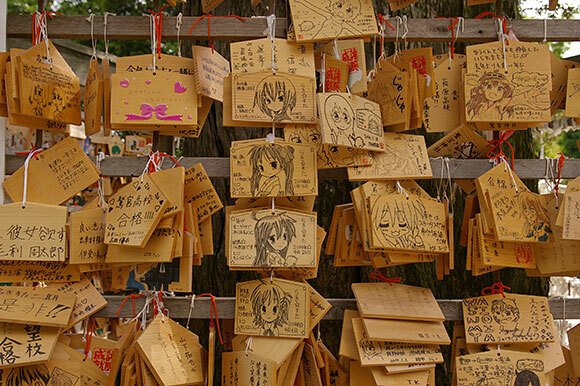 Even the 絵馬 (ema; wooden plaque marked with a wish) left by visitors are adorned with cute drawings from the show. Here’s one sure way to beat the heat this summer; head to Hokkaido! Just imagine that you’re cooling off in the winter climate, surrounded by all that 雪 (yuki; snow). 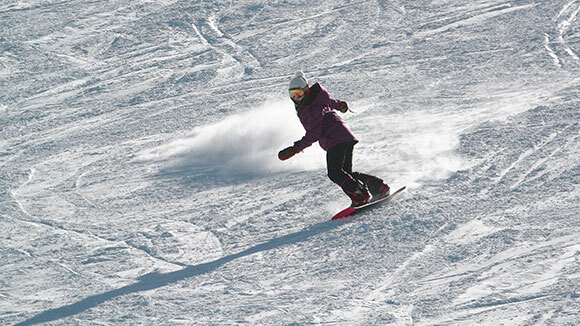 While you’re there, you go racing down the slopes on your skis, churning up the 粉雪 (kona yuki; powdered snow) as you fly past, enjoying the cool air. You stop at the bottom of the hill and bend to pick up a handful of snow, watching as the fine powder trickles through your fingers. That is さらさら(sara sara), the fine texture of the powdered snow on the ski slopes. 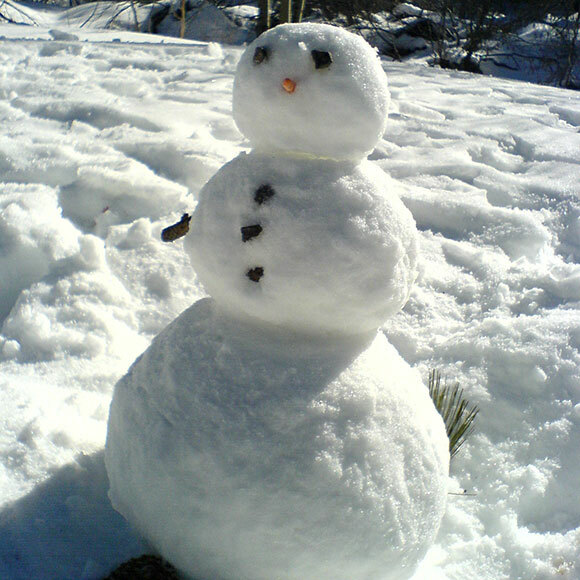 If you’d rather slow things down, why not try building your own 雪だるま(yuki daruma; snowman)? If you head to a slightly warmer area, you’ll find ぼたん雪(botan yuki). This kind of snow is made up of larger flakes, and clumps together better than 粉雪(kona yuki). Better yet, you can 丸める(marumeru; make round) this snow into a 雪玉(yuki dama; snowball). Just be careful, or you might get caught up in a 雪合戦(yuki gassen; snowball fight)!